Move over Mayochup, there's a new condiment in town (a couple of them actually). Feel like mayonnaising up your barbecue? There's a sauce for that. Just can't eat mustard without mayo? There's a sauce for that, too. Mayo is having a moment, and Heinz has gone all mash-up on us. Last year, the condiment company threw a mayo-ketchup blend at us, brilliantly (?) named Mayochup. What started as a social media stunt, asking Twitter how it felt about the mash-up, turned into a real thing. "We heard you saucy Americans, and we're bringing you our version of the delicious duo you've been eating for years," said Heinze in a Tweet last April. 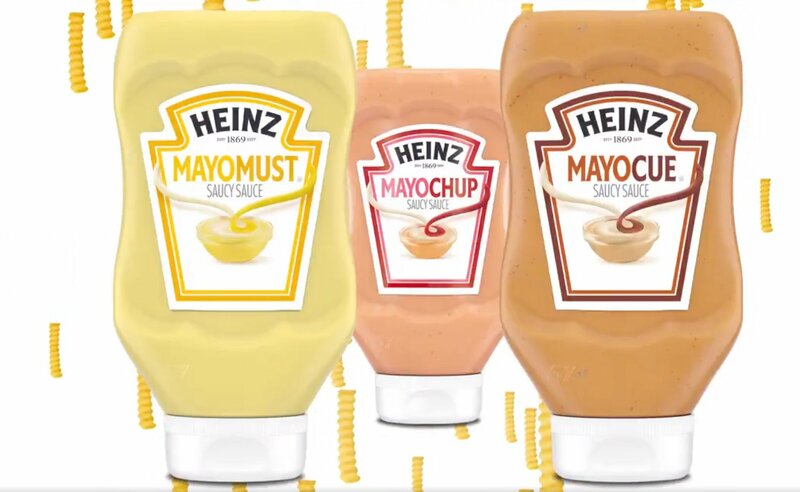 It's been flying off the store shelves and inspired more mayonnaise shenanigans, as Heinz has announced two new additions to the line: Mayocue, a barbecue sauce blend, and Mayomust, a mustard blend. Now you'll save about five seconds by squeezing the perfectly balanced mayo-barbecue sauce or mayo-mustard mix, rather than mixing your own. Thesauces will be sold in 16.5-oz bottles for a suggested retail price of $3.49 per bottle and will appear at major retailers and online, including Amazon, this month. If you just can't wait to get updates about when these creations will hit shelves, you can follow Heinz on Twitter @HeinzKetchup_US. Thanks to the fans of Mayochup, our saucy family is growing! Which flavor mashup are you most excited to dip into? Are these mayo concoctions the thing your food has always been missing or is it an abomination? What crazy combos do you think Heinz should come up with next? Let us know in the comments below.